Our Emergency and Industrial Phones are designed to provide quick and reliable communications for industrial and area of refuge locations. We carry industrial and emgerncy phones from Guardian, Viliking Electronics and Rath Communications. 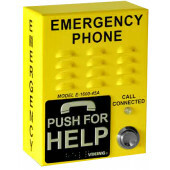 The emergency phones meet ADA requirements for emergency telephones, and can be programmed to automatically dial 911. We also carry weather proof phones for industrial use. 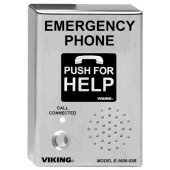 These phones are perfect for Cold Storage, Food Processing Plants, or any facility that requires communications in cold wet environments.